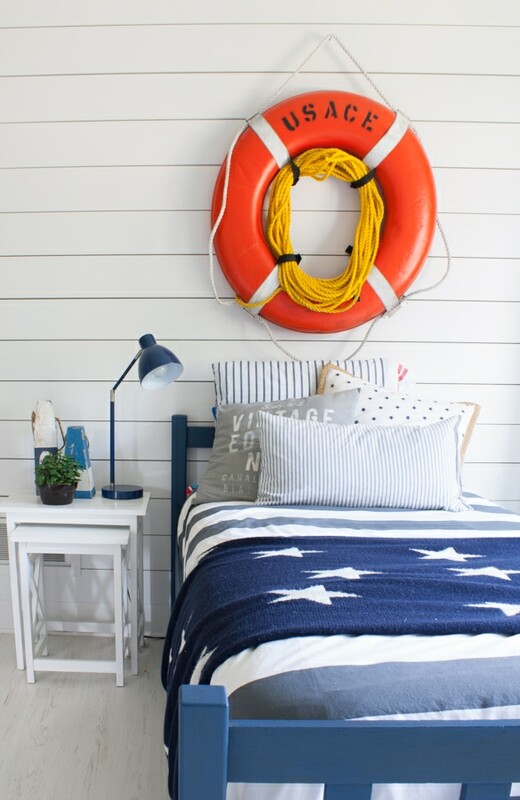 While I chug coffee (and watch Olympics) I’m sharing a few quick changes we made in my little man’s nautical boy room. Now that he is 5 (sob), we decided it was safe to turn the bed away from the wall which gives him a little more floor space to play trains in here. His contribution to the room was picking out his new Paw Patrol sheets which are safely hidden under his blankets, making us both happy. The stuff we had on the wall didn’t work with the new arrangement and was feeling a little busy anyway. Luckily I scored this cool vintage floaty ring thing (totally blanking on what these are called!) at the Allegan Antique Flea Market. The guy I bought it from said it was off a boat in the Upper Peninsula, so I thought that was pretty cool. Little man’s favorite color is orange so he was all about it too. I stole a few pillows from the playroom to update the bed and also found this star blanket at Target on sale after the 4th of July. I realize I was in such a hurry to quick snap this room that I didn’t actually style these shelves, this is all him. Who doesn’t need a wire basket full of transformers and a batman piggy bank? Also could his preschool wood sculpture next to that piggy bank be any cuter!? These were the framed prints that were above his bed and I swapped them over to his little desk wall. Quick tip – these are actually gift bags that I framed using leftover scrap wood find the tutorial here. 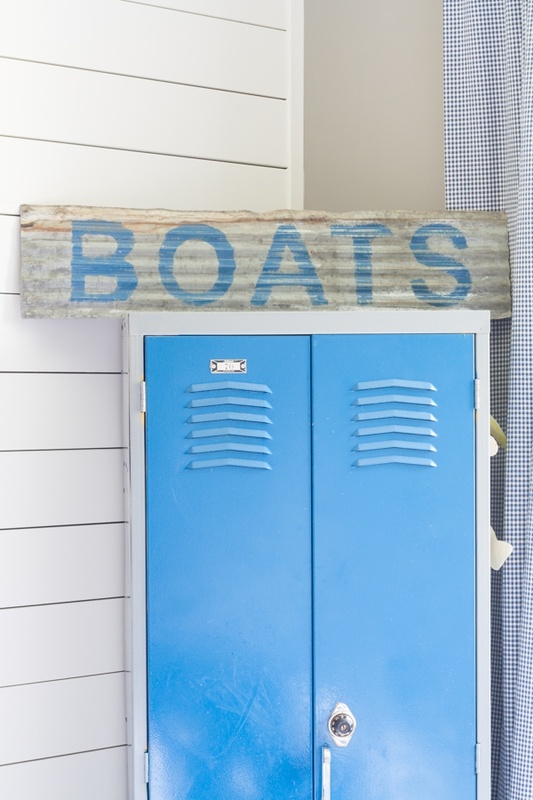 The “boats” sign is another flea market find that found it’s way in here. Hi, nice room. I’m wondering if you’ll share where you purchased the bed? We bought beds like this in white from Ikea. Theres a trundle hidden under ours and the drawers! I’ll look forward to all that is to come! Thans Beth can’t wait to share – soon! I bet the little guy is thrilled with his new room. how cute is that! i loved his before room too but I totally get needing to accept the fact that our babies are getting bigger. I am planning a change in my 8 years room that is still sporting his nursrey theme. Yikes! No they will always be our babies!! Can’t handle the growing up! Love the room as I love all your rooms! The boats sign is just gorgeous. That is one lucky little boy! It’s a great room. Love it all. I think your son done an excellent job of styling his shelves! Cute stuff. He did! Batman piggy bank for the win! I love the orange thingy!! Clever! This is beyond cute.. I hope your news isn’t that your moving😩😩😩😩. Don’t keep us in suspense too long! I would not be on this thingy either if I had a lakefront property like yours. Enjoy every freakin minute! This is such a cute room! 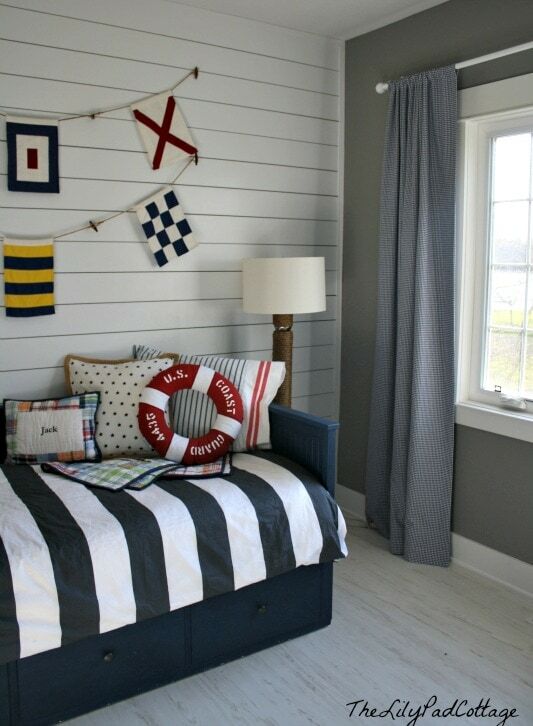 I LOVE the shiplap walls! Totally drooling. Nice changes! Now it’s more a “big boy” room, but still has charm! Perfect design for both a lake house and a growing boy. 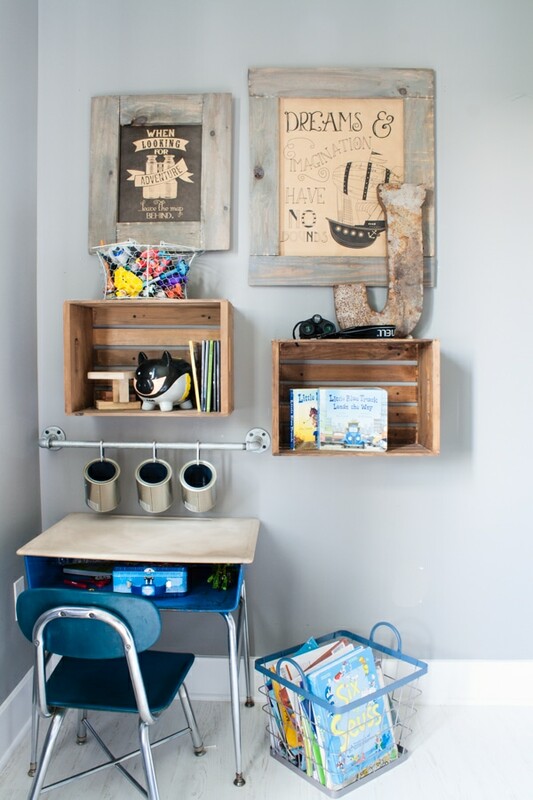 Also, the shiplap wall looks to be an ideal scale for a clean, modern presentation … we’ve going to “shiplap” a wall soon, what width (height) board did you use and how much spacing between boards (did you use a penny, nickel, pencil or other!) Thanks for anything you can share. 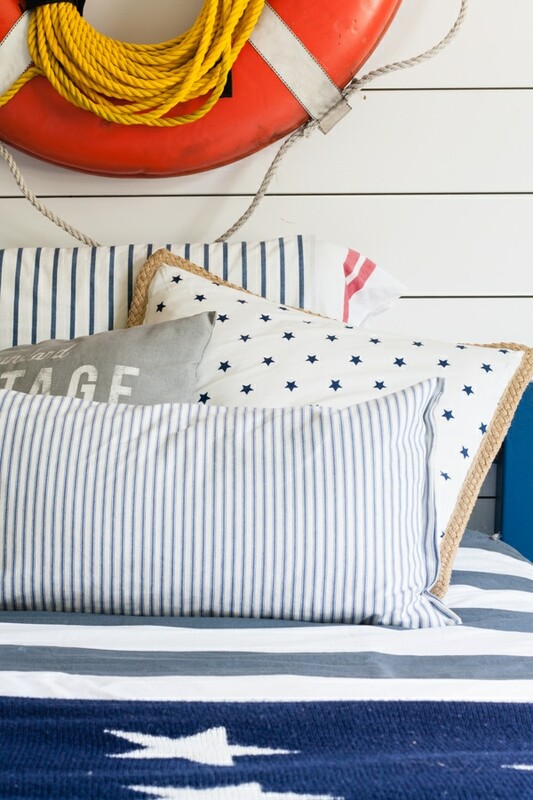 Love the nautical flags. Could you share were you got them. I would love to spell out my last name to add in out media room. They are from Land of Nod a few years back, thanks! 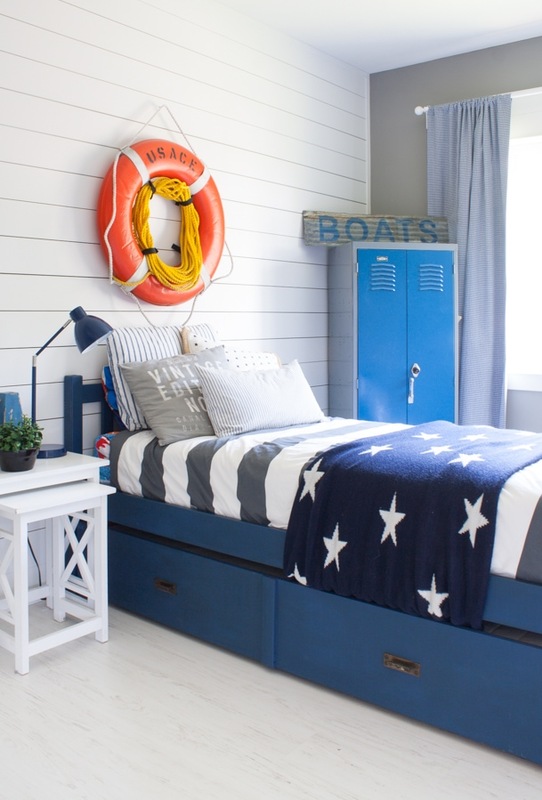 Where did you get the navy blue lamp that angles for your son”s room? I’m using your room for inspiration on boys new room! Do you have a trim (crown molding type) on your ceiling? 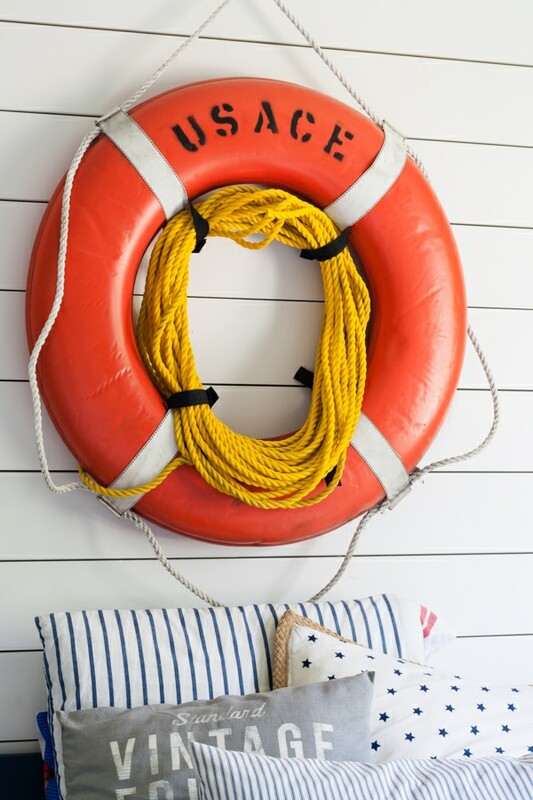 I didn’t know if I needed it with the shiplap wall or if I should leave it and just paint. Thanks!